Sauté onions and garlic in butter, season with salt and pepper and let simmer for 5 minutes. Add wine and beef broth and reduce to one cup. 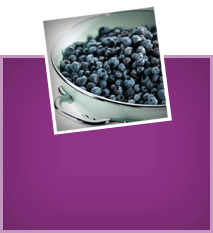 Add frozen wild blueberries and currant jelly and simmer, stirring occasionally for 5 minutes. Remove from heat and cool slightly. Wash venison, dab dry and cut into 12 equally sized medallions. Fix with skewers. Heat 1 tbsp. clarified butter in skillet. Sear medallions from all sides 3-4 minutes and season with salt and pepper. Remove medallions from pan, keep warm. Wash apples and rub dry. 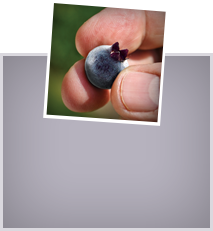 Remove cores and cut into slices. Heat ½ tbsp. of butter and sear the apple slices, approx. 3 minutes. 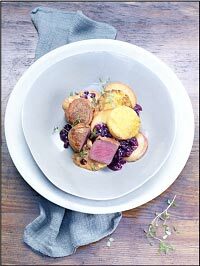 Serve venison medallions with apple slices and wild blueberry sauce. Garnish with fresh thyme leaves.